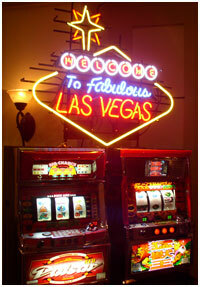 We Bring the Fun & Excitement of a Las Vegas Casino Directly to You! It’s simple and it’s high-energy! Whether it’s a private banquet facility, a poolside patio, a hotel ballroom, or your own private residence, we’re there! 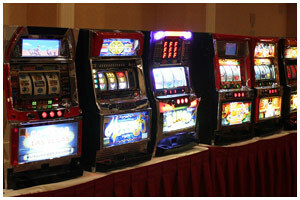 The Main Event Company provides top of the line authentic casino equipment which we own, rather than lease, including Blackjack tables, Craps Tables, Roulette Tables, Texas Hold’em Tables, Pai Gow Tables, Let It Ride Tables, 3 Card Poker Tables, Slot Machines and Money Wheels. 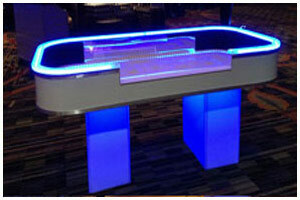 Our equipment is made specifically for us by a casino table manufacturing company in Nevada and our LED tables are licensed exclusively to us. No other Casino Company in Georgia carries them. Our LED tables are top of the line tables equipped with color changing lights, white leather armrests and stainless steel cup holders. You can create the mood and ambiance of your event by choosing from 12 different colors. The bases of the tables can also be branded with your company logo, company message, or sponsor. Our Standard tables are also top of the line tables equipped with felted tops, leather armrests and matching wooden legs. We do not skirt our tables and we do not have tables with metal legs. 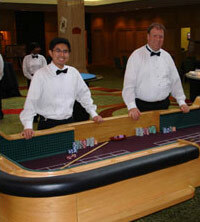 Our tables could very easily transition into a true Casino. Our chips are authentic 14.5g clay composite chips… the only of its kind used in the area! 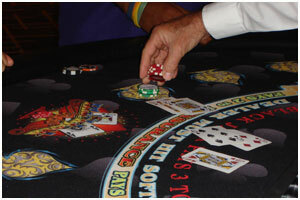 We use true Casino Craps Dice and Playing Cards that were actually used in a real Casino, including Bellagio, Bally’s, Cosmoplitan, just to name a few! The Main Event Team is professional, experienced, dedicated and willing to take the time to teach & explain the rules of the games. 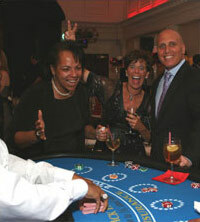 Our casino packages are inclusive of 3 hours of gaming, authentic casino tables, professional and experienced dealers, table accessories, prize assistance, setup, breakdown, , and raffle tickets. Additional hours may be added. In addition to gaming equipment, we can also provide Las Vegas Style Showgirls, Celebrity Look-a-Likes, DJ’s, Strolling Magicians, Caricaturists, Caterers, and Casino Décor. Simply let us know what you desire and we’ll make it a reality. GIVE US A CALL OR BOOK YOUR EVENT BELOW! WE OFFER THE MOST COMPETITITVE PRICES IN ATLANTA! Prices listed below. 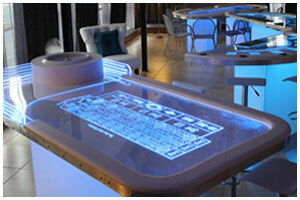 Please call for LED Table Pricing.